Bobo has stayed home sick from preschool the past few days. Cooped inside on a rainy day with a sick toddler, I’ve been brainstorming ideas to keep both of us from going stir-crazy. Today, I decided our project du jour would be to make paper handprint turkeys. Bobo loves craft projects, especially anything involving glue, which she doesn’t get to use much at home. We’re having my entire family over for Thanksgiving dinner in a few weeks, so I thought it would be fun to make turkey namecards for everyone’s plates. 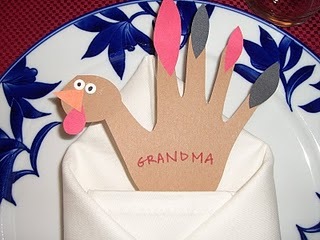 I guess I should have experimented with the first one before I embarked on making 16 turkeys. Bobo had a ball making the first turkey (hers), but then quickly got bored and moved on to something else. So much for my mother-daughter bonding project. I ended up making the other 15 turkeys myself, but I think they turned out pretty cute. Now, if only I can figure out how to actually make a real turkey, I will be set. 1-800-DOMINOES will be on speed dial just in case. Before I became a parent, I was blissfully unaware of the meaning words such as “Jibbitz.” After I had kids, and Bobo started dressing herself, Crocs (and Jibbitz, which are incidentally the little decorative buttons that go in the holes of Crocs) became a familiar term in my parenting lexicon. On one of J’s recent business trips, he brought back a pair of “Where the Wild Things Are” Jibbitz for Bobo’s new Crocs. Bobo was delighted by her new trinkets, and I had her grab her shoes from the front door so I could pop them in. Easier said than done. My 10 minute struggle to get Max to go into the hole did not make me a fan of the Jibbitz. Maybe it is just me, but I think Mr. Jibbitz and Mr. Croc clearly need to work on their communication skills. Either make the button smaller, or the hole bigger, people! I thought it was sweet that Bobo serenaded me with “All the fishies are swimming in the water” while I was in the shower this morning. I even joined in for a round or two. 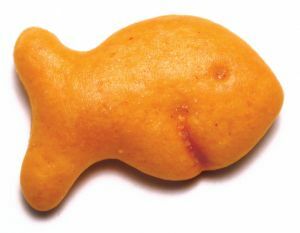 It wasn’t until I got out of the shower that I glanced down and saw the goldfish crackers floating in the toilet. Mr. Roto-Rooter should get a kick out of this one. Bobo’s new breakfast concoction: toasted bagel sandwich with peanut butter, bacon and cheese. It is pretty cute to see her artfully arrange the bacon bits and cheese on the bagel. Sometimes, for a finishing touch, she’ll add some dried blueberries as a garnish.